Electronic copy provided by the editor (thanks). I backed the project on Peerbackers. Copyright © The Future Fire, 2013. All rights reserved. 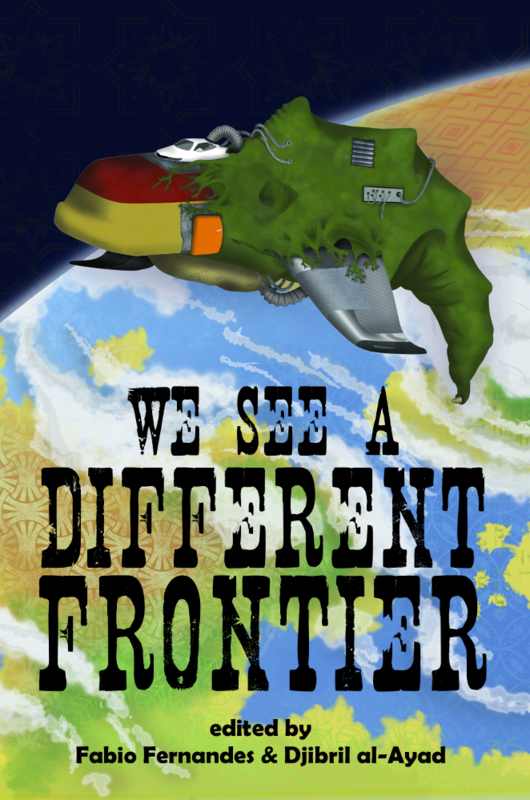 Coming out in August, _We See a Different Frontier_ is a new collection of short stories published by the wonderful online SFF magazine The Future Fire. The collection, like the mag, aims to give voice to authors from marginalized or racialized groups, or to stories whose characters are from such groups. More specifically, the book brings together all new speculative fiction from emerging and well-known authors focussing on colonialism, especially from outside the first-world viewpoint. More interestingly, even if the language of the collection is English, particular care is taken in favouring non-Anglo-American viewpoints. The editors' goal is to compensate for Anglophone SFF's long-standing tradition of being about colonizing: space, new stars, new planets, alien lands, the so-called final frontier. The point was to upturn SFF's tendency to exoticize (and feminize) the Alien, the way historical narrative has long tended to do the same with the Orient or the Arab world. I was particularly impressed with the editors' admission of just how hard they found the task of choosing which stories to include. They fully admit having to question their own presuppositions and (dare I say) prejudices in order to include the strongest, most provocative stories. Indeed, the stories are "all brilliant excoriations of one or another element of colonialism, imperialism, cultural appropriation or exploitation." (p. 13) Excoriation is right! They are actually elating in their damning of colonial situations whether overt or insidious. The introduction conclude: "These stories need to be heard. These stories need to be read." (p. 13) I could not agree more. "Fleet" by Sandra McDonald is a story which is a little flawed and that ends in a little bit of a cliché. Nevertheless, it is a gripping narrative, from the point of a trans character living on the island formally known as Guam. Isa is a Bridge, the member of the community neurologically implanted with the thousands of names of the dead from the Island's history and who is responsible for performing remembrance rites. As part of a group elected for the annual trip to the island's landfill, Isa meets two men from oversees, a rarity in a world where the entire electrical grid was destroyed by massive solar flares a century prior. McDonald masterly explores the dangers and pitfalls of the Politics of Memory of future Guam. An even more powerful exploration of Politics of Memory is found in the incredibly well-written, nearly perfect "Remembering Turinam" by N.A. Ratnayake. Here the scholar Salai walks from his world's (a future-Earth maybe) equivalent of a university the Heremitian Anushasan, formely specialized in the exploration of the abstract sciences. He goes to visit his grand-father, a former member of the same Anushasan, now living as a near hermit in his very final days. Both are Turians, a peaceful farming people whose country, the titular Turinam, was conquered two generations ago by the Rytari state, a highly bureaucratic, militaristic and ever-expanding Republic. In the decades following the conquest, the Rytari sucessfully appropriated Turian culture and eradicated their language. By assimilating the population into the Rytari language, they successfully changed the country's myths, history and cultural identity. Ratnayake is brilliant in showing the subtleties of Salai's colonized mind. More importantly, the author displays in all its tragedy the paradox of cultural survival in the face of conquest: how only those who choose assimilation can live long enough to ultimately reclaim the culture that has been willingly lost. For these two stories and the 14 others, especially for the Critical afterword by Ekateria Sedia, go buy the book! Your world will be changed! Edited on 31 July 2013, 17h: corrected a story title and author. Apologies for the possible confusion. Edited on 27 August 2013: So many typos!